It was a picture posted by Peter Kokot (a Slovenian developer) on the PHP group on Facebook that got me thinking. Hello, PHPers. A friendly reminder to spread awareness and support of equality because discrimination separates us. Today is the International Day Against Homophobia, Transphobia, and Biphobia. It’s a great sentiment, and a great looking Elephpant, just a pity that it’s phpotoshopped, and not a real Elephpant. As the owner of a small herd of Elephpants already, I thought that a Rainbow Elephpant would be a wonderful addition to increase the awareness of diversity within my own herd. Over the years, a number of organisations and companies like Zend, Symfony and the Amsterdam PHP group have produced Elephpants based on Vincent Pontier’s (aka. ElRoubio) original design, in a range of colours and with varying logos on the side. Often these have been given away to attendees at conferences. Others have been run through kickstarter projects to help raise funds for PHPWomen, or the ongoing development of Laravel, or other good causes. The Field Guide to Elephpants details the different variants that have appeared over the years. I have a reasonable-sized herd, though there are still a few missing from my collection: if anybody reading this has a spare Zend Framework green Elephpant, or a black Symfony 10th anniversary Elephpant, or a Z-Ray or Oracle blue one, or a Chili red that they no longer want, then I’d be happy to take them off your hands…. but I digress. Meanwhile (after that shameless bit of begging), back to the Diversity Rainbow Elephpant. Between kickstarter Elephpants like PHPWomen, Laravel, PHPArchitect and TrueNorthPHP, or backing from organisations like Zend, Symfony or Shopware AG, or conferences like SunshinePHP or ConFoo, others have fulfilled the dream and created new Elephpants to join the global PHP herd. If they could do so, why couldn’t I? So I’m looking to fund a new rainbow Elephpant to promote PHP Diversity. I posted a short tweet including the picture just to gauge the level of interest in a Diversity Rainbow Elephant (together with Peter’s picture), and was overwhelmed by the response… I really shouldn’t leave my mobile phone in vibrate mode on a desktop when I post something like that; the likes and retweets set it dancing among my papers every few seconds as it advised me that something was happening to my original message. I don’t yet know how practical it is to achieve that rainbow colouring in an Elephpant, blending the colours neatly at the seams, and the joins; or if it can be achieved at a reasonable cost; but the twitter response suggested that there was enough interest to take this project forward. I’ve been in communication with the good people at elePHPant Official, who have forwarded it on to the manufacturers to see what can be done; so the wheels have now been set in motion. I’ve had a number of offers of help and support from both North America and Europe, and I will be getting in contact with others who have done this type of thing before (like PHPArchitect and the AmsterdamPHP group) to find out the potential problems and pitfalls that they encountered. And if the manufacturer’s response is that the PHP Diversity Rainbow Elephpant is technically possible, and financially reasonable, then I’ll look to set up a kickstarter project to help with the funding. If costs are significantly higher, I may still look to fund a limited run. At the moment, it really comes down to waiting on the manufacturer’s response; but I really do want to make this happen. I want to create an Elephpant that looks just like the one shown in Peter’s image, with the different colours and hues of the rainbow blending into each other rather than a more fixed (straight line) rainbow stripe that some people have suggested might be more practical: that blurring of the colours better expresses Diversity than the rigid barriers of a fixed stripe (the whole point of Diversity is eliminating barriers). It might make the stitching at the seams and the merging the tail colour and the colour-coordinating of the toes harder. I don’t even know if it’s possible; and if it is, what cost implications would it have that might price it higher than the more traditional Elephpants. But if it is feasible then it’s also likely to make every single rainbow Elephpant subtly different and individual, yet all still part of the great world-wide herd, just like the diversity of developers that it represents… and that’s what I want the PHP Diversity Rainbow Elephpant to say. I think the only difference that I want to see is the PHP logo rather than the php7 logo on the side. 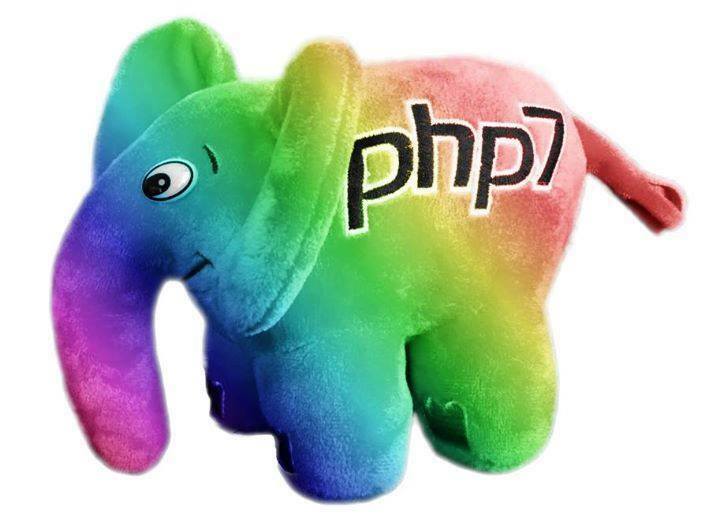 The PHP Diversity Rainbow Elephpant shouldn’t make people feel excluded based on the version of PHP that they run either: as Peter’s original message said, “Let’s not discriminate based on … technology”. While I’m not the biggest fan of adverts, I might consider a company logo on the reverse if any business was prepared to sponsor the project and help defray the costs, or keeping the reverse of the Elephpant pristine, but possibly with promotional materials to go inside the boxes when distributing the Elephpants through the post. But it would need to be a company/companies that actively promoted Diversity in all its forms. What I do know, is that if this project comes to fruition, the first PHP Diversity Rainbow Elephpant would go to Peter Kokot for his inspiration. This post transferred from a post originally made on the blog site at markbakeruk.net on 18th May 2016. If you want to keep up with the ongoing adventures of the PHP Diversity Rainbow Elephpant, you can follow RainbowLePHPant on Twitter.